Intoxicating notes of citrus blossom, pineapple, and lychee aromatics with underlying hints of wet stone minerality. Bright and racy acidity frames the mid-palate with zesty notes of grapefruit, lime zest, and white watermelons. The wine will develop some natural tartrate crystals through aging. Enjoy chilled at 45F and let this unique wine blossom as it warms up in the glass. The 1,615 acre Somerston Estate is located 10 miles east of the Silverado Trail, high in the eastern hills of the Napa Valley. The owner, Allan Chapman, and General Manager, Craig Becker, are committed to sustainable practices reflected throughout the property. Primarily a Cabernet vineyard, Somerston has a jewel box sized block of Grenache Blanc near its southern border. Priest Ranch Block 6 sits at 1,250 feet elevation and is some of the only Grenache Blanc planted in Napa County. Block 6 was hand-harvested at dawn and whole clusters were pressed cold first thing in the morning. The wine received as little skin contact as possible and was put through a very gentle "sparkling wine" program in the bladder press. The clear juice was racked to a Stainless Steel tank to ferment. The primary fermentation never reached 65°F to preserve freshness and no malolactic fermentation was allowed. The wine was lightly filtered prior to bottling in April. The 2017 vintage was a one for the record books highlighted by the intense fires in Sonoma and Napa counties that burned thousands of acres in mid-October. Luckily, many of the grapes from the vintage were already harvested. The growing season before the fires was fantastic after the deluge of rain in the winter that charged the soils, filled the reservoirs, and brought most of California out of a decade of drought. The season was progressing slowly, and evenly when in August, an intense heat wave over Labor Day weekend arrested ripening. There is quite a difference between the wines harvested before and after the heat wave, the wines harvested after the heat wave and before the fires, and the wines harvested after the fires and before the rain in late October. 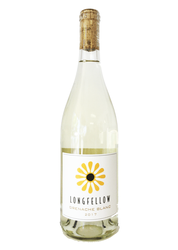 The Longfellow Grenache Blanc was harvested before the fires.